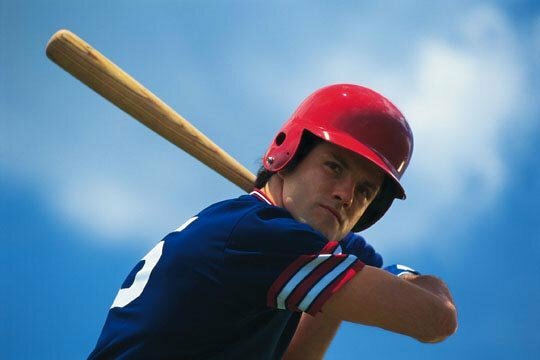 Bodybuilding Training And Dieting For Improved Performance In Baseball! Bodybuilding is an activity that not only can be used for bigger musculature and less fat, but also for increased performance in sports. In this case … baseball. Use this detailed strength training program to improve your game! Bodybuilding is an activity that not only can be used for bigger musculature and less fat, but also for increased performance in sports. In the case of baseball, bodybuilding training can be used as a means to increase strength and prevent injuries. Strengthening the rotator cuff muscles as well as the core muscles, for instance, can not only prevent injuries but also allow for more overall strength that will allow for a faster pitch or for a stronger batting ability. In addition, increasing leg strength can contribute to a faster sprint from base to base. Can Allow For A Stronger Batting Ability. The program that will be presented here will be the weight training component of your overall training program provided by your coach, which may consist of various isometric, isotonic and isokinetic exercises, sprints, stretching, plyometrics and many other drills. Depending on the position you play, your coach may instruct you to emphasize different elements of your program and to specialize in certain body parts. For example, catchers, infielders and outfielders need to emphasize wrist, hand and core abdominal strength as well as general flexibility (especially in the legs). Pitchers however need general strength, flexibility and endurance with emphasis on the rotator cuff muscles and shoulders. Note: Off days can be used for extra rotator cuff work as well as abdominal work and wrist work. A key component for increasing performance in any sport is nutrition. Nutrition gives us the raw materials for recuperation, energy and growth. Without a good diet, it is impossible to get any results from the training required for any sport. Your nutrition program needs to provide your body with quality nutrients in the form of carbohydrates (which serve to provide energy), proteins (which provide the amino acids to repair muscle tissue and other tissues in the body), good fats (which support healthy hormonal production) and finally water (most of your body is made up of water). Each serving approximately equals 6 grams of carbohydrates. First thing in the morning before departing to school. Between 9-9:30AM as you change classes. Drink your bodyweight x 0.66 in ounces of water throughout the day. Your body is mostly composed of water so if you do not drink your daily requirement you may be jeopardizing your muscle gains and also not letting your body get rid of the toxins and waste produced by all of the physical activity efficiently. Supplements are actually a subcomponent of nutrition. When it comes to gaining lean muscle mass, strength, or increasing sports performance most people think that bodybuilding supplements are the most important part of the equation. However, this could not be any farther from the truth. Supplements are just additions to an already good nutrition and training program. Only when training and nutrition are maximized, then you can start thinking of adding supplements to your program. A good set of multivitamins and minerals to avoid any nutritional deficiencies. A good protein powder to take in between real meals so that it is easier and more convenient for you to increase your protein to the levels that you need. A good tub of high quality protein like Pro V60 will do the trick. If you need to gain weight, because you are a hardgainer (a person with a fast metabolism who has issues gaining weight) then I would go for a high quality weight gainer that is low in sugars and that has a variety of fast released and slow released proteins like Lean Body Mass 60. A couple of tablespoons of good fats such as flax oil in order to cover your essential fatty acids needs. You can add these to your shakes. I would save the creatine, and other more advanced supplements, for later on in your career, once you have turned 18 and have achieved some pretty solid gains already. Believe it or not, I did not use supplements such as creatine until I turned 25. Definitely, stay away from any testosterone boosting supplementation. Right now (since you are a teenager) your body produces a ton of anabolic steroids (testosterone and growth hormone mainly) that will greatly help you in your quest to build muscle rapidly while losing body fat. Anything that you do trying to further boost your testosterone production may do the exact opposite. Save testosterone boosters for when your body starts to slowly decline in testosterone production, which is around 25-years old. However, research shows that 1,000 mg of Vitamin C at breakfast, lunch and dinner will actually help you in your quest to a more muscular body. The supplementation program above, in conjunction with a good diet (see the sample bodybuilding diet above), a good training program based off basic exercises (see the sample bodybuilding routine above), rest (yes, you need at least 8 hours of sleep each night) and the determination to execute your program day in and day out will take you to where you want to go. If budget allows instead of a 5-lb protein tub, you can opt for easier-to-carry and more convenient items like protein bars, meal replacement powders or ready-to-drink shakes. Labrada Nutrition offers several top-notch bars, meal replacement powders and ready-to-drink shakes that not only offer great nutrition but have a taste to match as well. However, convenience comes with an added cost, so if budget is tight, simply carry the servings you will need of your protein powder individually sealed on a Ziploc bag in your cooler and mix them with water or milk when it is time to consume. You will need a shaker bottle for this but all high quality proteins these days are instantized and therefore mix rather easily.